Digimat 2018 brings new levels of efficiency for as-manufactured structural analysis of reinforced plastic components through major enhancements of Digimat-RP. A completely redesigned user interface welcomes the connection to more molding manufacturing data such as weld line, fiber volume fraction, fiber length and residual stresses. Accurate design of short or long fiber-reinforced plastic components as well as SMC has never been easier! The Additive Manufacturing solution of Digimat 2018.0 has been extended all along its material/process/part performance capabilities, including virtual characterization of lattice structures in Digimat-FE, enhanced physics in Digimat-AM and access to standard structural analysis workflow in Digimat-RP. With this release, the partnership of Stratasys and e-Xstream is made official. Virtual printing and structural analysis of components made of Ultem 9085 and printed with Fortus 900mc are now possible through Digimat-AM and Digimat-RP solutions. Advanced failure modeling of short and long fiber reinforced plastic structures have been improved to better account for polymer sensitivity to stress triaxiality on composite failure initiation. Damage of such structures can now be modeled more precisely through a controllable damage law for enhanced energy dissipation predictions in crash simulation. Digimat 2018.0 brings many additional new capabilities and enhancements. Computer Aided Engineering (CAE) describes virtual environments that give designers, engineers and analysts the ability to simulate product ­ scenarios, they can determine specific scenarios, designs and configurations that would be successful and eliminate those that would be prohibitively expensive or physically impossible to manufacture. This type of virtual testing and design environment allows manufacturers to greatly reduce, or even eliminate, costly physical testing. The CAE umbrella includes 3 main simulation directions: Finite Element Analysis (FEA) for structural analysis, Computational Fluid Dynamics (CFD) for analysis of gaseous or liquid flows and Multi-body Dynamics (MBD) for analyzing the dynamics of systems. 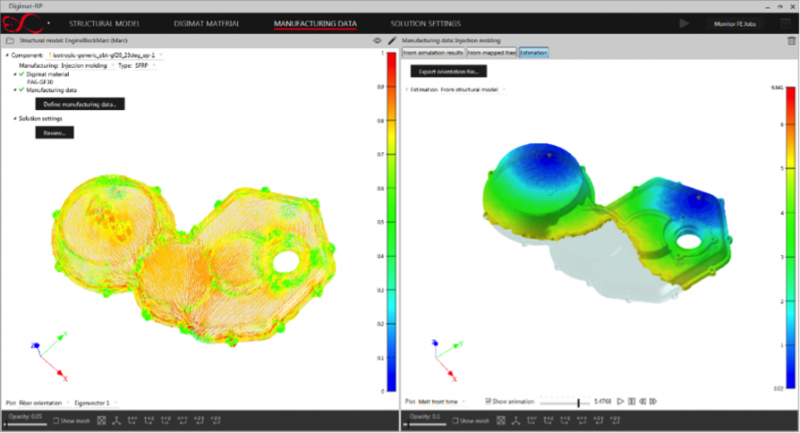 MSC Software's portfolio includes tools in all these three areas that provide these types of virtual environments for designing, optimizing and testing new materials, fabrication processes (forming, welding and additive manufacture), parts and systems.